Podcast 16 completed, blog post done. Ugly potholder made and too thin binding created for said potholder. Binding completed on pocket only and given up for the outside binding. Good idea, ugly potholder (not right for me), need to start over and use a larger binding. I finally pulled off the red pocket on this potholder, cut another larger binding that matches the outside, and struggled with getting the binding to match up on this small project. I also sewed down the binding back by machine. Finished the front of a complicated nametag. Found extra binding that had complimentary colors to my nametag, then sewed the binding on said nametag. Binding on something this small was a pain and I had to watch a binding tutorial several times and there was many instances of thrusting binding and resewing the top. Currently binding pinned down ready to be sewn to the back, which is something to do at work after lunch. Cut out a few series of 6 pentagons to create a small fabric ball, about hackysack size. Will sew these pentagons down like grandma flower garden blocks. Only three dimensional. 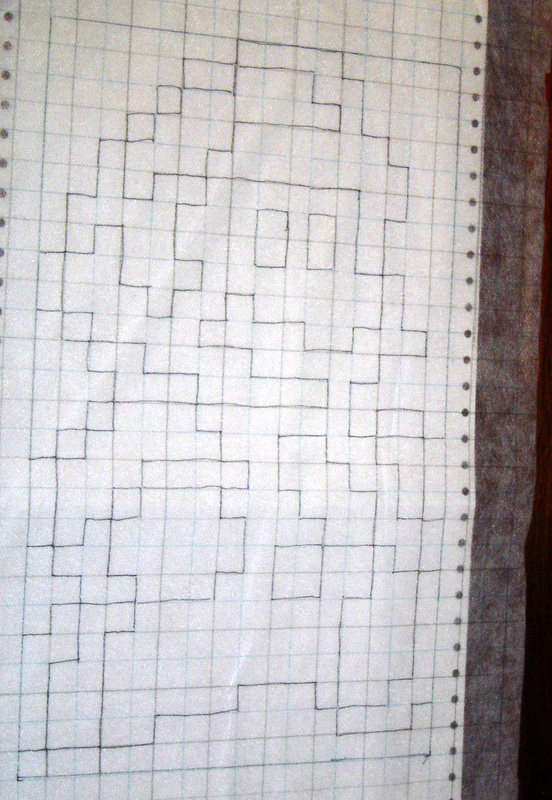 Played a small amount of Super Mario Brothers 3 on my computer to take some screen shots for a new mario quilt. Entire quilt not completely designed as of yet. Found a place for super mario 3 sprites to download. Here is a Mario 3 outline I created from one of the SMB3 Mario sprites. 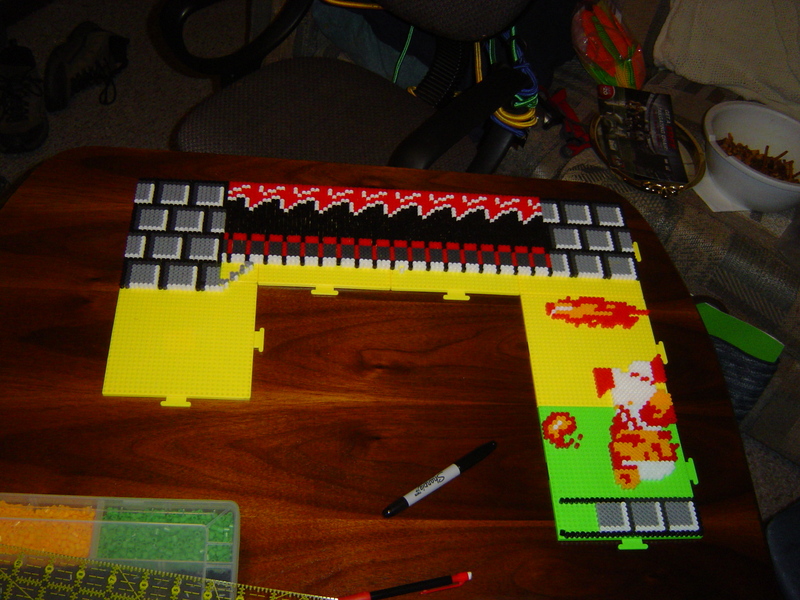 Worked on super mario brothers 1 perler bead project. This is the project worked on most of the time this craftcation. Here is the progress so far. Used photoshop and the grid functionality on photoshop to create accurate sprites for perler beads. Currently waiting for more background peg boards for perler beads to continue. The other major project catapulted one of my UFO’s into the forefront. I prepped two different birds for appliqueing onto my daisy quilt. Prepping for something this complicated sure was a lot of work! It’ll be worth it though. Also learned about some EQ7 features that I haven’t used yet, like premade layouts, and block symmetry for the entire quilt. Also was reminded of a great suggestion on file managment for EQ7 files (and other files). Watched the entire Harry Potter series of movies that has been produced so far. Watched about 6 additional movies and several more TV programs. Created a poorly constructed eyeglass case for my one dollar sunglasses. Need to refine this. Some of the construction problems were due to scrap size of the batting I had available. I also tried a technique to narrow the bottom by sewing corners in before folding the case over, which resulted in a funny shaped bottom. Also wrong, wrong bead for the clasp. A thinner piece of elastic (I have some blue elastic around here somewhere!) would also be helpful with the closure. But to protect 1 dollar sunglasses – sure thing. Some colorful binding created for my black and white quilt. Well the binding is cut and sewed together anyway. Still need 11/12 border corner blocks to complete. Found the blocks so I can be ready to sew them soon. Started thinking about the next podcast, getting a blog post started for that. Many many happy days crafting and thinking about crafting. Happy trails! These are all great projects. I love the name tag and the daisy quilt. Good job!